A friend of mine recently reminded me about a stage I’m looking forward to experiencing with my second child: the Why Stage. If you’ve ever had a three year old, then you know exactly what I’m talking about. It’s something you’ll never forget. The Why Stage can be worse than tantrums, worse than fights over clothing, worse than bedtime battles. Like the slow drip of water torture, the Why Stage wears you down subtly. Drop by drop, question by question, it erodes your brain into mush. In case you’ve never had a three year old and don’t know what I’m talking about, I’ll explain. The Why Stage is the point at which your child’s long-anticipated ability to talk transforms from “cute and fun” to “frustrating and annoying.” One minute you’re making videos of your child saying “Hi! Bye! Baby!” The next minute you’re trying to ignore him as he chatters on and on outside a locked car in the parking lot while you try to remember what you did with your keys. But you can’t ignore the Why Stage. Because in the Why Stage, your child asks questions, and questions require an answer. If you don’t answer, he will keep asking over and over and over in a louder and louder voice. He will keep getting louder until you break down and respond or the parking lot security guard comes over to make sure you’re not torturing him. Whichever happens first. But answering, you will soon learn, does you no good at all. Because on the other side of your answer, your child lies in wait with another question. And another. And another. Your answers aren’t satisfying; they’re just fodder for more questions. Child: Mommy, what are you doing? Child: Why are you peeling potatoes? You: So we can eat them for dinner. Child: Why are we going to eat them for dinner? You: Because we need to eat something, and I felt like making potatoes. Child: Why did you feel like making potatoes? You: Because my body is hungry for potatoes. Child: Why is your body hungry for potatoes? You: Because it’s been five hours since I ate lunch. Child: Why has it been five hours since you ate lunch? You: Because five hours ago was lunchtime. Child: Why was that lunchtime? You: Because it was noon. Child: Why was it noon? You: Um. Because the sun was halfway between rising and setting. Child: Why was the sun halfway between rising and setting? You (realizing uncomfortably how little you actually know about astronomy): Because of the rotation of the earth. Child: Why because of the rotation of the earth? You: That’s just how it works. Child: Why is that how it works? Child: Why don’t you know? You: Because I don’t know everything! I’m not going to answer any more questions now, okay? Child: Why aren’t you going to answer any more questions? You: Because you’re driving me crazy. Child: Why am I driving you crazy? And if you think that’s cute, then you have obviously never lived through it. It’s cute when it goes on for five minutes with somebody else’s kid. But when it goes on for twelve hours straight, it will do you in. By bedtime you will be reduced to a screaming puddle of goo, like the wicked witch of the west, and you will have no energy left to do anything but sit on the couch and stare at the wall. If anyone — like, for example, your hapless spouse — asks you one more question — like “How was your day?” — you will throw a pillow at them. Or possibly a shoe. But I told you I was looking forward to this stage, right? Because I have found the secret way to survive it. No, not to survive it. To overcome it. I have learned how to defeat the Why Stage. Yes, my friend: I can outsmart a three year old. Big words, and long, detailed answers. Here’s the thing. Your three year old, despite his impressive ability to (mostly) switch pronouns correctly from “I” to “you” when repeating your words back in the form of a question, doesn’t really understand most of what he’s saying. That’s why he asks why. He’s practicing the art of conversation. He’s uncovering how things work. He’s trying to learn the meaning of life. He is, in other words, trying to exercise his mental capacities to the limit. He wants to grow his brain. So all you need to do is oblige him. Stop trying to give him toddler-sized answers. Instead, give him more information than he can understand. This will cause his brain to stop flipping answers to questions as it pauses to try to digest the information. Which will cause a reset that will stop the endless question-answer-question cycle. For example, let’s take the conversation above. We’ll start where things get interesting and potentially complicated — when you introduce the topic of astronomy. Child: Why was five hours ago lunchtime? You: Because as the earth was completing its daily rotation around its axis, we had reached the place where the sun’s meridian reached the zenith, placing it at its highest point from our perspective, which makes it noon local time. Child: Can I have dinner now? Child: Why did the earth complete its, um, rotion around its axes? You: Because as planets form through the coalescence of space dust, the gravitational pull of the star causes them to spin, and the conservation of angular momentum makes them spin faster as they collapse into planets, and then they keep spinning because of inertia, because the vacuum of space offers no resistance to their movement. As you get better at this, you can make it into a game. My husband and I used to have contests to see who could keep going the longest and come up with the best answers. He always won, because he knows more about science and math than I do. I was often embarrassed to realize that I don’t actually understand electricity, gravity, or the manufacturing of pretzels well enough to explain them to a three year old. But that’s another advantage of using big words: it doesn’t matter if your explanation isn’t exactly correct. Your kid won’t understand anyway. And if your spouse happens to be listening to your not-precisely-correct explanation of how cell phones work, you have the perfect excuse for your lack of knowledge. It’s not that you don’t know these things. It’s just that your child is in the Why Stage. You’ve been answering why questions all day long. You have every right to be confused. Your brain is mush. Finally, when in doubt, you can always resort to the ultimate answer to life, the universe, and everything. 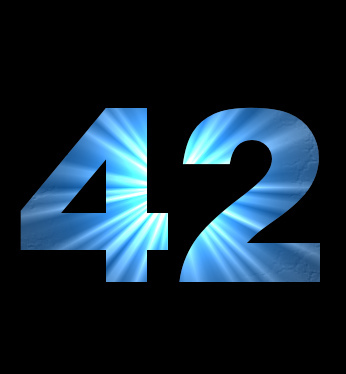 Just keep repeating it in answer to every question: 42. The real answer is 13. Seriously? 2 commenters who have no idea that 42 is the answer to life, the universe, and everything? Have you people even read THE BOOK?!? The best, funniest, most enjoyable book ever published. You people need to read.